After the last walk on Ben Vorlich yesterdays stroll up Beinn Narnain was in complete contrast. 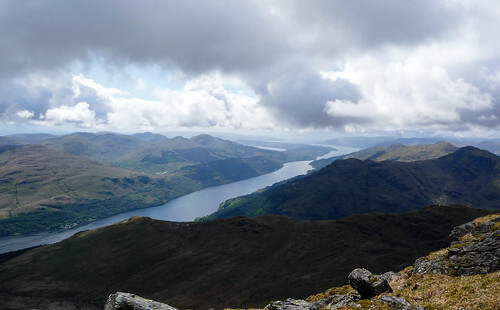 Narnain is also (just) a munro and is situated on the banks of Loch Long, just across from Arrochar. The biggest difference was the weather – it was an almost perfect day! The next biggest difference – we followed the path! Heading out from the car park it was a fairly straightforward path towards the Cobbler on the left and Narnain to the right. This was our only rain of the day on the hill and it quickly passed. We left the path a bit early (or missed an earlier path) so we had a bit of a slog for about 40 mins. After that though it was path for most of the way. There was also quite a bit more scrambling than before and it was a little slippy underfoot at some points. However once we got to the top the views were stunning. 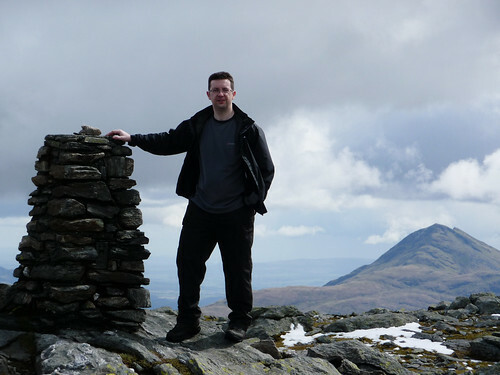 Picture above is where I had lunch and here’s me at the trig point on top of Narnain. With lot’s of breaks it took just under three hours to get to the top which was pretty good going. The route down was pretty good with a clear path and some scrambling over rocks but nothing too taxing. One option was to do The Cobbler as well but we decided to keep that for another day. Something I should have done was put on some sun cream. I burn easily and with the better weather I’ve got a red nose and neck today. Nothing too bad but easily preventable. I again used RunKeeper to track the route and this time it didn’t work flawlessly. The iPhone/RunKeeper lost GPS signal or at least couldn’t get an accurate signal and it thought we had walked 16 miles near the top of Narnain. 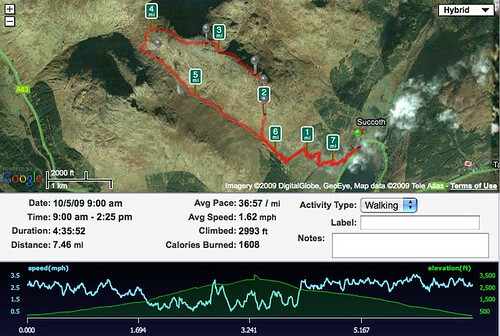 When I loaded the total walk up to the RunKeeper site it was showing we had walked over 20 miles. Damn. However you can now edit the route by moving waypoints. Five minutes later and with the route corrected RunKeeper updated the walk calculating the correct distance. Fantastic. This was also the first time with the newly updated RunKeeper which now lets you switch the screen off while using it. The battery life is now much improved. By the time I go to the top of Ben Narnain I still had 1/3 battery life left. I plugged in my battery pack and it only took a quarter of the charge to fully charge the iPhone. I now expect to be able to track for at least 10 hours which is really good and much longer than I initially expected. So that’s my second Munro done. Full Flickr set is available here. I wonder where we’ll end up in June?